while the field is the world. The good seed are those who belong to the kingdom, while the weeds are those who belong to the evil one. and the field is the world, and the good seed, these are the sons of the kingdom, but the tares are the sons of evil. and the field [represents] the world. 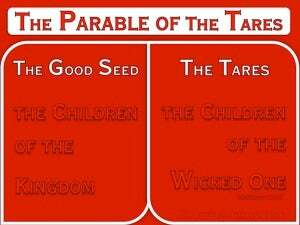 The good seed [represents] the children who belong to the kingdom, and the weeds [represent] the children who belong to the evil one [i.e., the devil]. The field is the world. The good seed is the people of the kingdom. The weeds are the wicked. 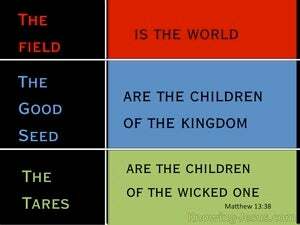 The field is the world; the good seed are the children of the kingdom, but the darnel are the children of the wicked one. and the field is the world. And the good seed--these are the sons of the kingdom, but the darnel are the sons of the evil one. the field is the world; the good seed are the sons of the kingdom; but the darnel are the sons of the evil one. and the field is the world. And the children of the kingdom, they are the good seed. And the tares are the children of the wicked. "the field is the world; the good seed is the sons of the kingdom; the weeds, the sons of the Evil One. the field is the world; the good seed--these are the sons of the Kingdom; the darnel, the sons of the Evil one. the field is the world; the good seed are the members of the kingdom; the wild wheat seed are the followers of the wicked one. 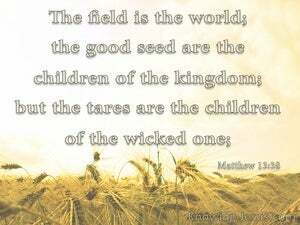 the field is the world; the good seed are the children of my kingdom; and the tares are the children of the wicked one. 37 And He said, "The one who sows the good seed is the Son of Man, 38 and the field is the world; and as for the good seed, these are the sons of the kingdom; and the tares are the sons of the evil one; 39 and the enemy who sowed them is the devil, and the harvest is the end of the age; and the reapers are angels. "I will whistle for them to gather them together, For I have redeemed them; And they will be as numerous as they were before.